Why Can't I Use My Phone On A Plane? Anyone who frequently takes to the friendly skies knows the announcement: "At this time the use of portable electronic devices including cellphones, mp3 players and portable computers is not allowed." If you're like me, you've probably always wondered… is banning the use of our constant electronic companions really necessary? Of course, most travelers choose to error on the side of caution but my smartphone is my camera! If I turn that off then I might miss some good shots! As my flight lifted off from Reagan International airpot yesterday and I watched the Washington monument slide into the distance without a single good picture of it on my SD card, I again found myself pondering just why exactly I couldn't take a couple of bird-eye-view shots of Washington now that I had the chance. It turns out that the answer is more complicated then I had imagined. Most people are probably familiar with the theory that cell phones and other devices that are capable of broadcasting electromagnetic radiation could, potentially, interfere with guidance and navigation equipment on commercial planes. But is that really possible? At least in the US, the FCC regulates how all electronic devices use the limited electromagnetic spectrum. Surely they should be able to make sure that there is no bleed over between the bands reserved for commercial electronics and those sections of the spectrum used in commercial avionics, right? In theory yes, but as we all know… our beloved electronic toys rarely play nice with each other. Have you ever had your cellphone near your computer speakers and hear a strange crackling noise? Or have you been driving down the highway and had your radio suddenly fade out and be replaced by the CB traffic of a passing police car or semi? These are great examples of unintentional interference, where our tools take on a life of their own when given the freedom to play outside of the lab. Even the human body is capable of causing interference with certain electronic devices! Have you ever noticed that radio or TV reception can improve when you touch your radio or the old rabbit ears (for those old enough to remember them)? Electronic interference can come from hundreds of unlikely sources and predicting just how two devices will interact with each other is a hard nut to crack. With the uncertainty of just how nicely consumer electronics will play with commercial avionics and anecdotal evidence pointing to increasing rates of malfunctions with the advent of mobile telephones, the Federal Avionics Administration(FAA) banned the use of many electronics devices on planes in '91. But airlines have long since taken steps to prevent electronic interference including shielding both cockpit and wiring, surely it's time for the FAA to throw caution to the wind and give us our smartphones back! But the ban is more complicated then that…. While using a cellphone on a plane will most likely not cause your jumbo to drop out of the sky like a sack of bricks, it's not just the FAA, who doesn't want passengers chatting the flight away. Cellular service providers also are against the use of cellphones on planes. We all know how smartphones work- your dial a number and your smartphone looks for the nearest tower and starts a connection allowing you to start a call or a data connection. When you're on the ground and not moving very fast, most cellphones only have the choice of a couple of towers making it easy for the provider's system to choose which tower to route the single through. But when a user is in the air, the smartphone can potentially reach dozens, if not hundreds of cellular towers which causes a major headache for the cell system as it tries to figure out exactly which tower would be the best choice to root the single through. What's more, when you factor in that most flights are moving in excess of 500 mph, its easy to see how a communications system designed for use on the ground could quickly throw up its hands in frustration. But it's not just the cell providers who are for the ban, many passengers also are opposed to the use of cellphones on commercial flights. If you've ever been on a plane with a screaming baby, you know how annoying flying with someone who just won't shut up can be. Now imagine the entire plane is suddenly gabbing away complaining about every detail of their flight. 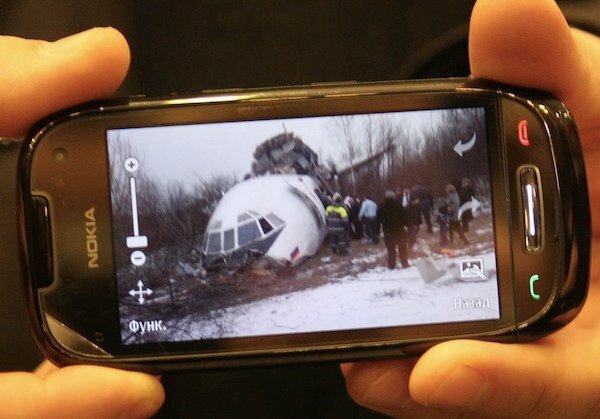 That is the horror scenario that many passengers imagine, if cellphone use was allowed during flight. When the government decided to readdress the cell ban a couple of years ago, they were quickly flooded with complaints from all corners of the US and quickly decided to drop the idea. At the end of the day, while the use of cellular phones is still banned on commercial flights, as soon as commercial airlines figure out a way to make a buck off of cellular use, the ban will most likely be lifted. Of course there are still concerns about interference from the radio transmitters in modern smartphones, but several European companies have had success bring wifi and cellular service to commercial flights inside Europe so it's only a matter of time before their models go international. Of course, that won't give me back the photo ops I missed flying out of Washington and into Chicago yesterday, but at least I'll have a reason to visit these two glorious cities again! So to add on to this, once you hit above a certain feet you can't make a call anyways so on long flights you are set ;P and I ride in single engine airplanes all the time. I used my phone when I was riding with my uncle. Which is the part I don't understand as all the evil stuffs off and the little electromagnetism left is minute. Nope i have an airplane mode but as the kind cabin Crew informed me, airplane mode cannot be used during take off, landing or on the runway which was when I was trying to get my shots! You have a Phone without Airplane mode? Then you are in the wrong blog. You have to go to the “My 10 year NOKIA works fine” Nostalgia Blog.